Yup you read that right. But heart is really good! I promise. Just like chicken liver makes a great pasta sauce, give this organ a chance to impress. Organ meats are part of the whole animal, and humans have a very long history of using every bit. Only recently have our palates become pickier, such that regular pieces like bones, tail, tongue, and liver are no longer the norm, and are even looked at askance. Organ meats can be tremendously beneficial for your health, supplying tons of iron, selenium, and other trace and important minerals. They can of course, also wreck your health, if eaten from tainted sources or too frequently. Organ meats do tend to include higher than muscle levels of cholesterol. Kelly the Kitchen Kop has a great article containing many common objections to organ meats, along with the true facts. 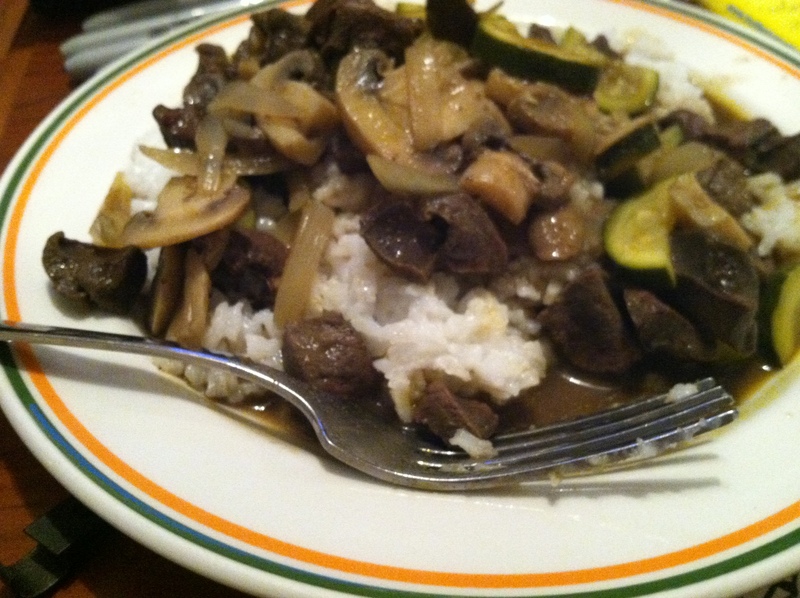 Beef heart is a great organ meat to start with, because it’s flavorful, surprisingly lean, and inexpensive. On average, a serving costs half of a comparable serving of beef chuck roast, and the taste is much milder than liver (for those having nightmares of “liver and onions” right now). A 3-ounce serving of beef heart has just 95 calories and 15 grams of protein, and only contains 3 grams of total fat in a 3-ounce serving, which is only slightly more than the same portion of chicken breast. 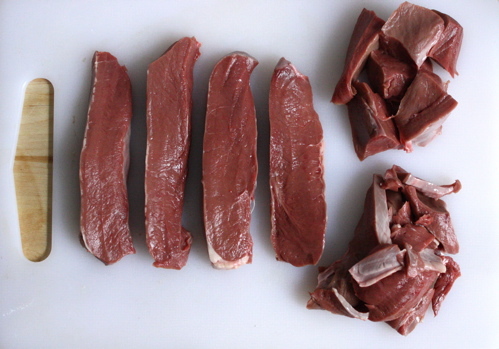 Beef heart is a rich source of all the B vitamins except folate, but it’s especially high in vitamin B-12. Three ounces provide more than 200 percent of the recommended daily intake. Many cultures which still enjoy organ meats use beef heart, such as anticuchos, a beef heart kebab which is the most popular dish in Peru. Argentina is a large beef producer, and nearly all the hearts are shipped to Peru because of such high demand. Beef heart takes well both to fast, high-heat searing and long, slow low-cooking. You can even ask your butcher to grind it up, and mix it into your lean ground beef. Bet you wouldn’t even notice a difference! 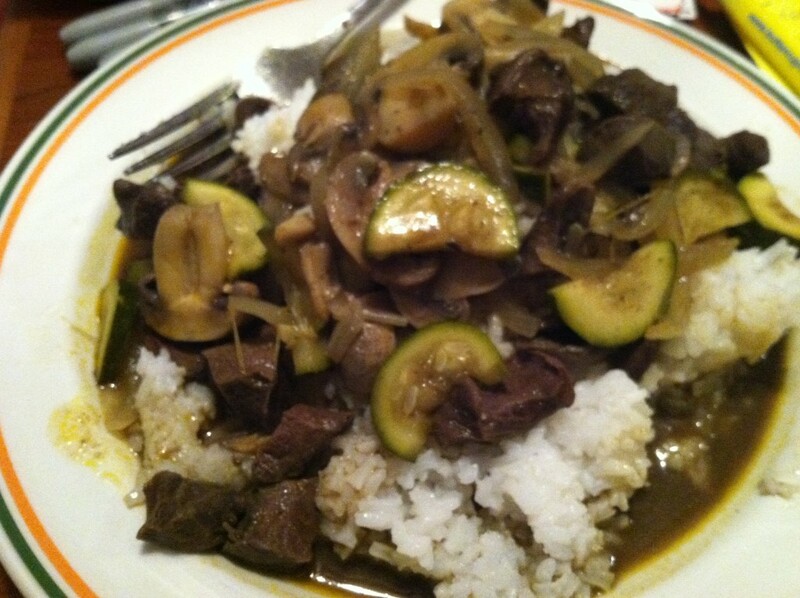 In this recipe, I combined very inexpensive, pre-cut heart with seasonally abundant zucchini for a ridiculously low-cost-per-plate meal, served with a simple sauce over rice. 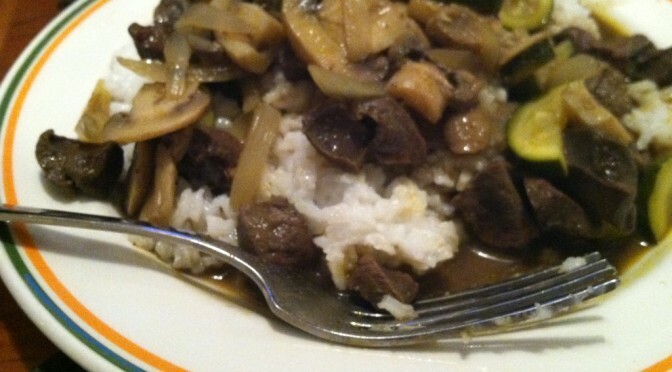 The beef (2lb) was $1.44, the zucchini was free from the garden, but let’s say you bought it at the store for about $1.00, an onion & some mushrooms would be about $1.00, and the 2 cups of rice maybe another $0.50 or so. A few tbsp of soy sauce and Worcestershire sauce adds a couple more pennies. That brings the total for two meals to about $3, or $1.50 per serving. Beat that, fast food! Step 1: Dice the onion, mushrooms, and zucchini. In a frying pan, add 1 tbsp oil and the veggies. Cover and cook for 8-10 minutes, stirring, until onion is translucent and the zucchini is softened. Step 2: If you didn’t buy pre-cut heart, cut the fat and tendons off the meat, then cut into chunks or strips. Add the meat and the sauces to the pan. Cook on medium heat 5-7 minutes, stirring, until meat is thoroughly cooked. Step 3: In a separate pot or rice cooker, cook 1-2 cups of rice. Serve half the mixture over half the rice on two plates. You could also serve this over couscous, quinoa, barley, brown rice, on its own, or in pita pockets. Dice the onion and zucchini. In a frying pan, add 1 tbsp oil and the veggies. Cover and cook for 8-10 minutes, stirring, until onion is translucent and the zucchini is softened. If you didn't buy pre-cut heart, cut the fat and tendons off the meat, then cut into chunks or strips. Add the meat and the sauces to the pan. Cook on medium heat 5-7 minutes, stirring, until meat is thoroughly cooked. Serve half the mixture over rice, couscous, quinoa, or on its own with juices.